The location is easily reacheable to most ammeinities & within walking distance to West Lake. Good location. It's near Airport Bus stop in Town. The apartment location is good. Receptionists very efficient and fast. The location is great.. waking distance to West lake and there's a night market right in front. Building is new and room is clean. Location is walking distance to shopping area and also to westlake. Night market just infront the building. 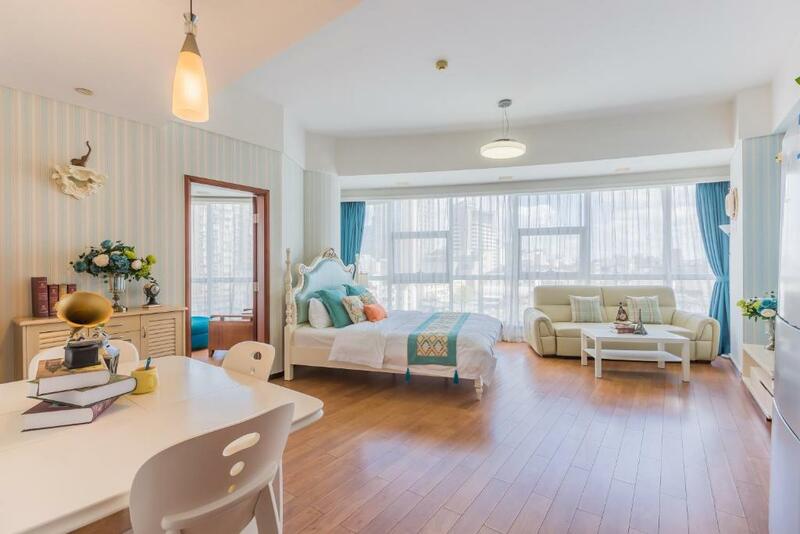 we love the room, spaces and near with xihu lake. Very good area. The location was great. Just in front of the hotel is a night market and West Lake is just a few streets down. The hotel is more like a service apartment but minus any cooking utensils. Check-in and out was easy and there are many cabs in the area. 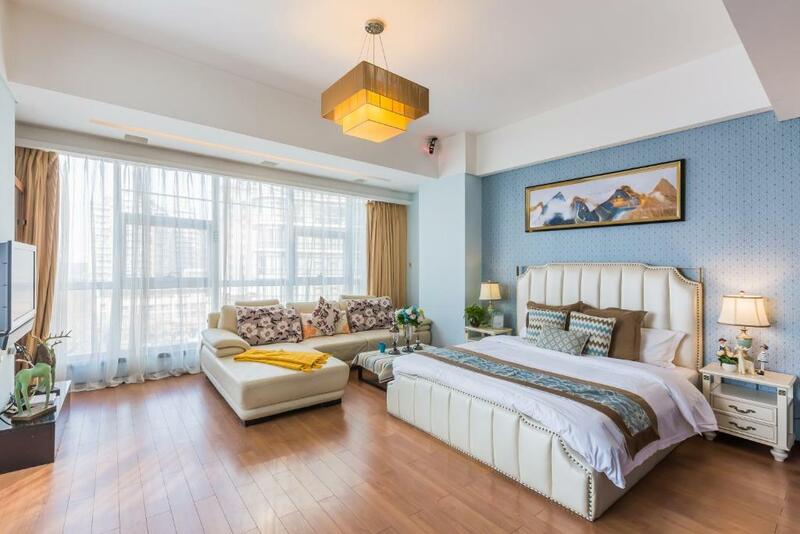 One of our top picks in Hangzhou.Located 2,300 feet from West Lake and featuring lake views, the property offers a restaurant, indoor pool and fitness room. Spacious apartments come with kitchenette, washing machine and free wired internet. Rooms are equipped with cable TV, a private bathroom and a writing desk. A fridge, tea/coffee maker and microwave are also provided. Guests can enjoy local dishes at Westlake 7 Hangzhou’s Zen restaurant. Facilities offered by the hotel include a spa, business center and games room. Hangzhou Westlake 7 provides airport shuttle and transport rentals. Laundry and dry cleaning services are also available. 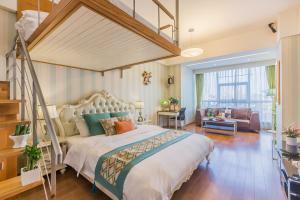 Westlake 7 Serviced Apartments is located near the Wu Shan Night Market and antique market. It is 19 mi away from Hangzhou Airport and 1.2 mi away from Hangzhou railway station. 뀐 Located in the real heart of Hangzhou, this property has an excellent location score of 8.5! 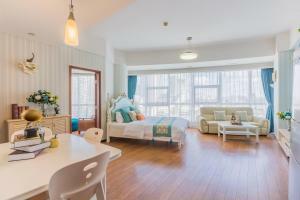 When would you like to stay at Westlake 7 Service Apartment? Room comes with a washing machine, an iron and a kitchenette. Public parking is available on site (reservation is needed) and costs CNY 40 per day. Spacious room with large windows. 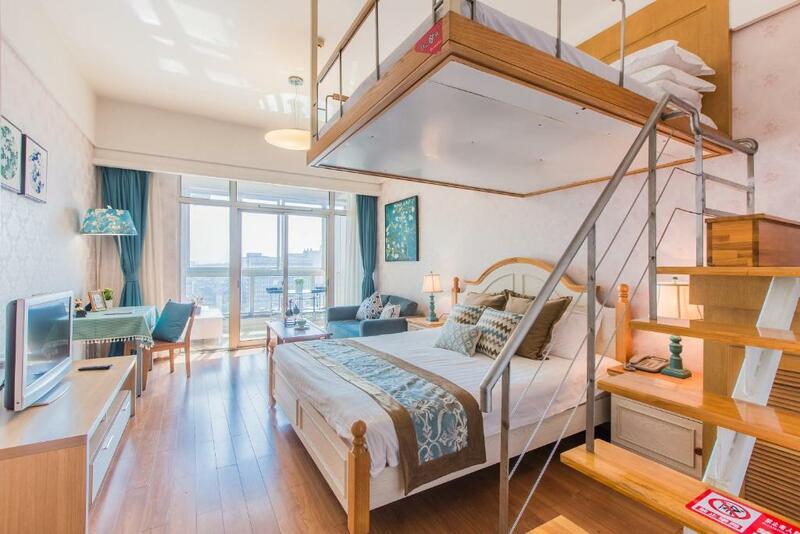 Room comes with a lovely hammock. 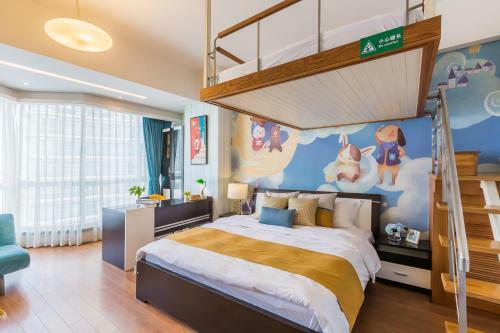 The bedding type is bunk bed. Room features a living room. 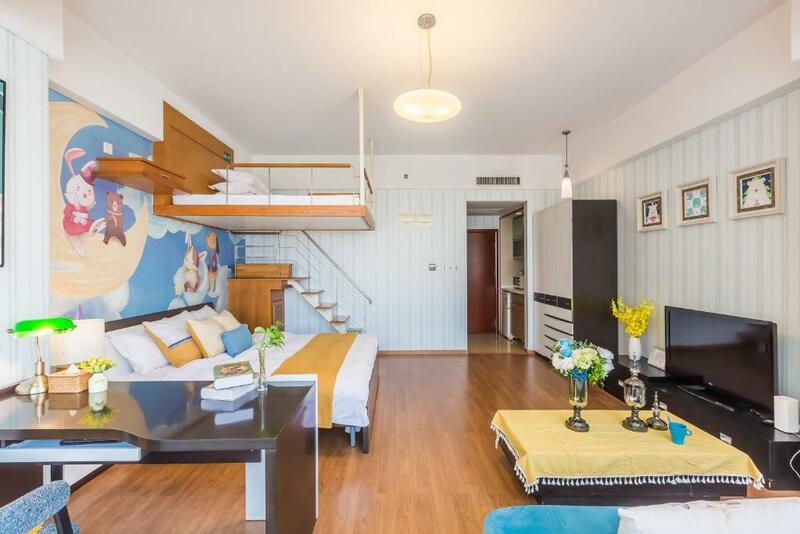 This suite features a washing machine, sofa and microwave. Area Info – This neighborhood is a great choice for travelers interested in lakes, sightseeing and scenery – Check location Great location - show map Guests loved walking around the neighborhood! House Rules Westlake 7 Service Apartment takes special requests – add in the next step! Westlake 7 Service Apartment accepts these cards and reserves the right to temporarily hold an amount prior to arrival. Please note that guests are to check-in at Block A Level 7 Unit 26. Public Holidays, Saturday and Sunday: 14:00 -21:30. Location close to the city centre. You can go by feet to the lake. The ventilating fan in the bathroom/toilet wasn't functioning! Noise from the floor above room. And the ventilation in the bathroom wasn't functioning. Location, cleanliness and spacious room. Lack of any utensils at the kitchenette area. they speak english a little bit. Poor air condition, let me feel uncomfortable, difficult to take breath. Very clean and price so cheap. The staffs can be a bit more friendlier but overall they were quite helpful. Only one thing that me and my friends dislike about the room is their heater system. You need to wait for quite long for the water to heat up if someone showered before you. Which is quite a waste of time and water could be cold during winter time. The room was pretty and comfy. The beds were large enough too. At the lobby got one small place that sell coffee and surprisingly the coffee there was great! The location was ok but nearby got shopping mall and even night market. Overall had a good experience staying here. This is an apartment in a large complex with a mixed use. The 'reception'desk is on the 7th floor of the building. There is no signage to indicate where you have to go to collect the keys to the apartment. No English is spoken by any of the staff. The apartment was not clean (although the towels and bed linen were clean) and the kitchen area smelt very bad. I would not stay here again. There was quite a bit of room in the apartment and the beds were reasonably comfortable. The apartment complex is located about 15 minutes walk away from the West Lake area. There is a night market immediately in front of the complex. A lack of hot water supply, and there was smoke smell in our room. luggage service may be improved. We weren't very happy with the hotel, firstly we couldn't find the entrance. It looks like you are getting into a different hotel, we asked in reception and the actual reception of the hotel was on the 7th floor (there were no indications at all) The Chinese staff could not speak a word in English, and were quite rude and careless, I'm 8 months pregnant and made me go upstairs and downstairs a couple of times until we got the right key code. They didn't explain absolutely anything about the facilities of the hotel and took a while to be able to enter the room. The room was okay but it was really stinky, the smell of cigarettes was unbearable. I don't think we will ever go back. The room was very big and the location was great, there are many shops and restaurants very close to the hotel. There was a night market next to it and one morning we discovered a local market where people where selling birds, antiques and lots of weird stuff from China right around the corner of the hotel. 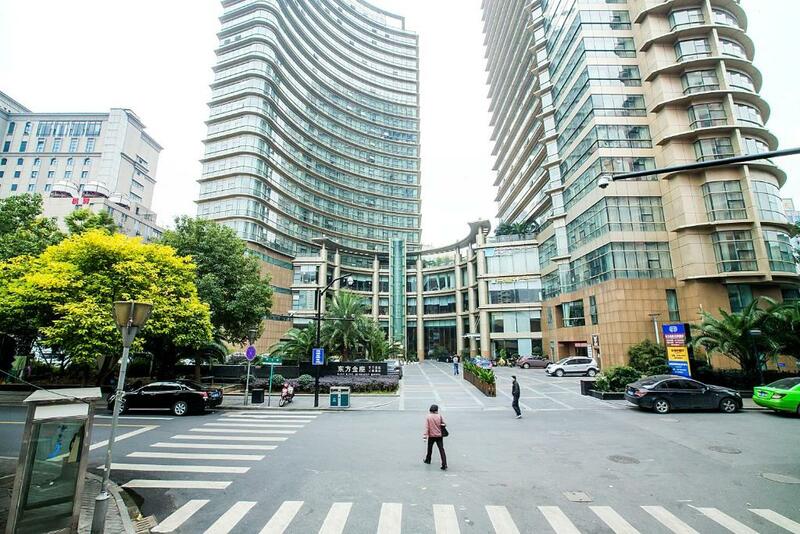 The underground and West Lake are within 10 minutes walking distance from the hotel, so location was perfect. The elevator did not go up to the 7th floor. We had to carry our luggage up 1 floor. The check in was chaotic. The reception littered with suitcases. Receptionists did not speak even a word of English. I speak a little bit of Mandarin and can understand most of what is spoken to me. They were also surly when we asked questions. Water was also not provided everyday in the room. When we asked, they said that they were unsure if we take that particular brand of water and so if we wanted any, we had to go to the reception to ask for it. When I asked the man downstairs at the reception how to walk to the metro station, he told me to get a map! Receptionist was also not familiar with bus stops and bus lines. All I wanted was to find out where I could get No.4 bus to the tourist sites. The receptionist refused to book a taxi for us to the train station, she told us to stand on the street outside. She said that it would cost more than a $100 to call a taxi. She told us to factor an hour more with suitcases in light rain to hail a taxi. We were not able to get a taxi, fortunately we met a kind soul who helped us arrange for Didi. The water pressure in the bathroom was dismal, in addition to that, the mixer is old fashioned. To top that all off, we had to wait about 20 minutes between each shower. Washing machine was available but there was no detergent. Fortunately, we brought our own. 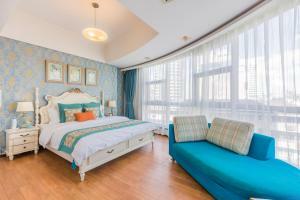 The location was very good, walking distance to food outlets, bus stop, train station and West Lake. Comfortable spacious room. Washing machine was also very useful. The heater worked well, even on very cold days. We were there when it snowed, Check out was fast, just handing the keys to them. It's a walking distance towards Westlake if you don't mind. Not that difficult to flag a cab. Cosy, comfortable, clean,cute design and child friendly... We love the room so much.